Jay Rayner slated Novikov Mayfair. His review was so harsh it hurt. Ouch! So I had reservations about going to Novikov. 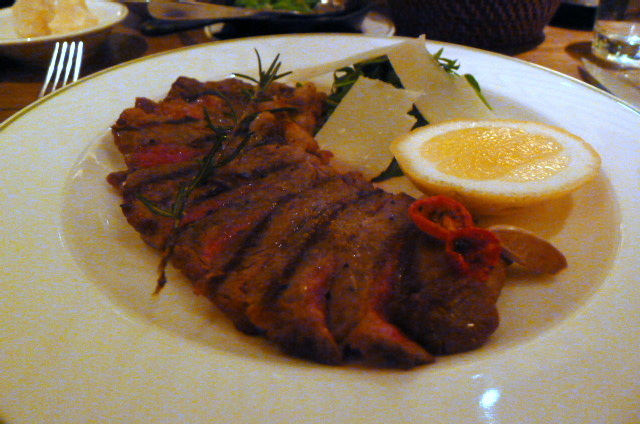 But curiosity got the better of me because like Rayner says in his review, Novikov is always full. So surely something about this place makes it a magnet for the crowds? Anyway, there was only one way to find out. The restaurant is owned by Arkady Novikov, a Russian millionaire restaurateur with more than 50 restaurants throughout Russia. 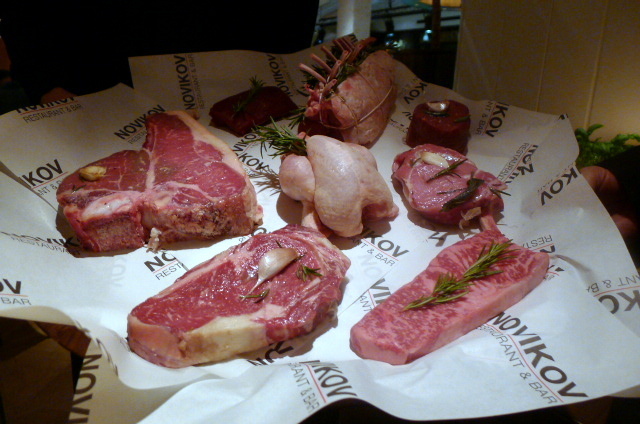 Novikov is his flagship London restaurant, in fact his first outside Russia. 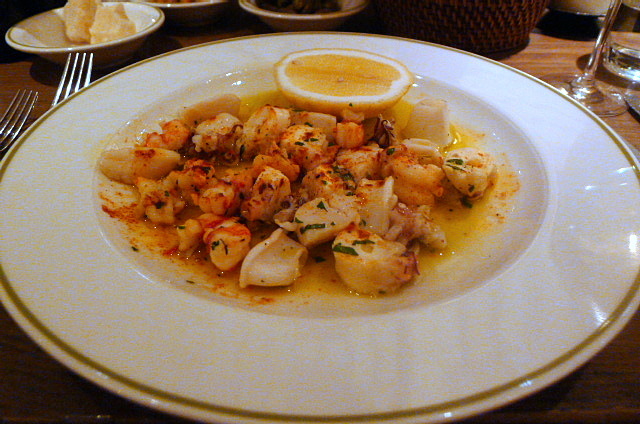 It is located on Berkeley Street in Mayfair, across the road from that pretentious celebrity haunt, Nobu Berkeley. Novikov is split between two restaurants, one serving pan-Asian food, and the other serving Italian food. There is also a lounge area in the basement for those just wanting drinks, plus a smallish bar area that graces the entrance to the venue. We elected to have Italian and the space dedicated to it is double in size to that of the pan-Asian area. Clearly Italian was deemed to be the more popular choice. The pan-Asian restaurant is what you see through the windows from the street and it is rather slick looking. In contrast, the décor of the Italian restaurant, which is tucked away in back away from public view, was a little cheesy. That said, as the space filled up and the atmosphere got busier, we seemed to notice the cheesiness less. This just goes to show that ambience has a lot to do with the feel of a place. We had the Cornish crab salad with “San Marzano” tomatoes (£19.50) that proved fresh and tasty but which contained a little too much residual shell. This meant you had to spend more time picking bits out of your mouth than you really ought to have had to. 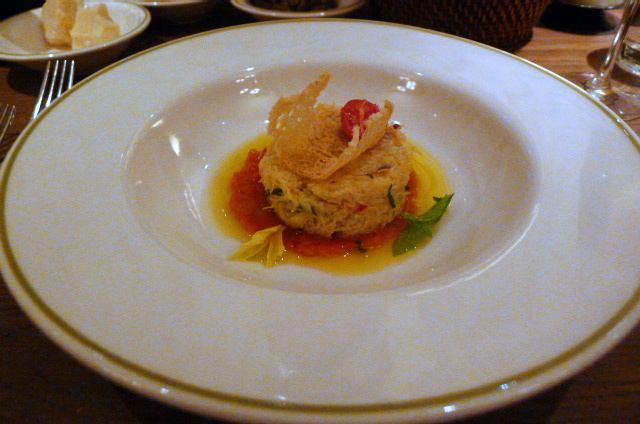 Nevertheless, the crab was much better than the seafood salad with scallops, prawns, squid, octopus & fresh chilli (£39). The salad fell flat, with the scallops being a little rubbery, the octopus being a little bland and the prawns being a little mushy. Furthermore, you couldn’t taste the chilli. This dish was very pricey for something so average. But the mains seemed to redeem the situation. Before orders were placed, the restaurant brought out the fish of the day for us to see. This was followed by a showing of the platter displaying the meat cuts of the day. I went for the marbled Australian Wagyu beef sirloin from Mollendo farm (£65) which was a really wonderful piece of meat and sublimely tasty. It had been nicely cooked to a medium rare and it oozed with lots of delicious fattiness. To be sure, £65 was expensive, but you can expect to pay this much for wagyu of this quality at the best restaurants. Umu charges something similar for their wagyu, and in this respect the wagyu did not feel overpriced even though it was not cheap. 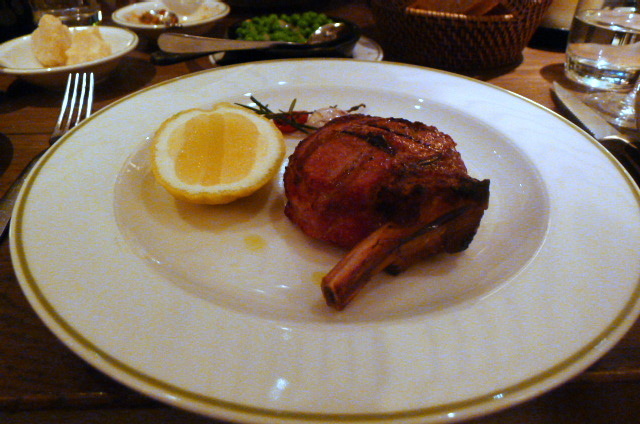 A thick veal chop (£49) from the specials also recorded high scores. It was again beautifully and evenly cooked to remain pink in the middle. In a testament to its quality it sang with flavour and tenderness, but at £49, it was expensive. The meats came with no sides so you are forced to order these if you want some. We went for a tomato salad (£7) that was truly fabulous. The tomatoes were amazingly sweet, and some fresh basil, thinly sliced red onion and a delicate olive oil dressing made up the rest of the salad. Fresh garden peas were tasty as well although they could have done with 30 seconds less cooking time for a bit more bite. But otherwise the peas were really easy to wolf down. Chocolate and chestnut semifredo with pear sorbet (£10) gave way to a rich chestnut flavour that was well balanced against the chocolate. 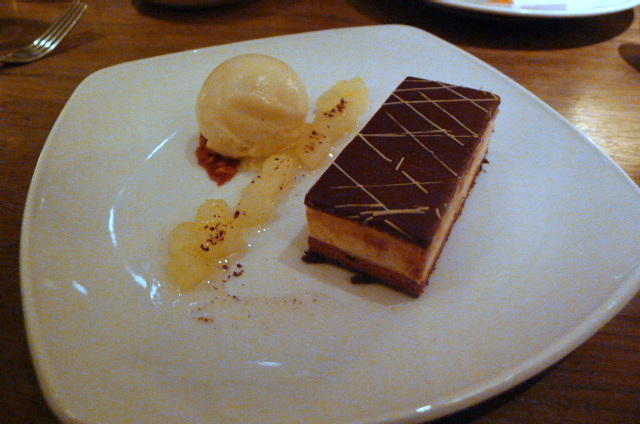 The pear sorbet worked well with the semifredo and sat on top of a buttery tuile that was fabulous. 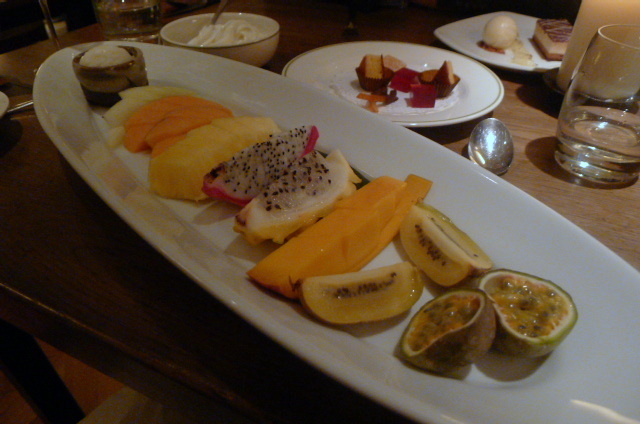 A large seasonal exotic fruit platter with sorbet (£12.50) was a feast for the eyes due to its size. A wonderfully ripe and lusciously sweet mango was the best fruit of the lot, but the rest of the platter, made up with dragonfruit, melon and pineapple didn’t quite hit the high notes of the mango in terms of either sweetness or ripeness. There was also some passion fruit that was very sour and should have probably been left off the platter. An accompanying lime sorbet was too sugary. 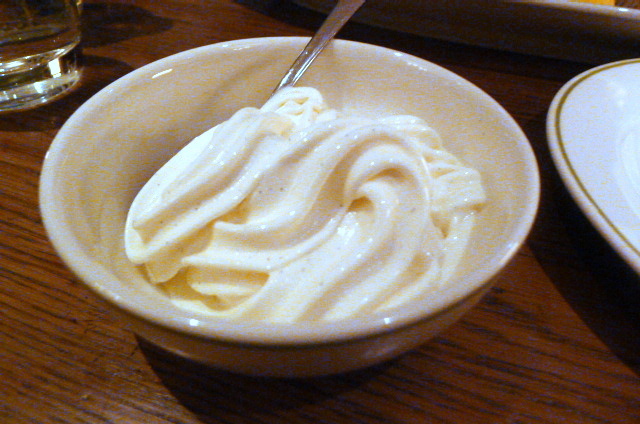 The restaurant also sent out a vanilla salt ice cream with our desserts. It wasn’t big on either the vanilla or salt flavours, but its texture was amazingly smooth and creamy and so it was still gorgeous to eat. Service wise, our experience did not get off to the best start. When we arrived, we were greeted by a very surly maitre’d who seemed to want to be anywhere else but there. But the rest of the service experience was quite nice and pleasant. Nevertheless, it wasn’t completely flawless for when it came to dessert time our waiter mistakenly gave one of our desserts to the table next to ours before soon realising the error. For wines, there was a big Italian wine list with the usual well-known names from Italy. There was also a good choice by the glass and the markup was about 75%. I think Jay Rayner was unnecessarily harsh. The food was not shocking like he said. In fact, it was far better than he made it out to be and on the whole rather enjoyable. The starters weren’t the best, but the meats were good and the desserts also showed certain skill. But what he was right about is that the restaurant is extremely expensive (although the desserts were reasonably priced). In that respect, Novikov isn’t the best value for money. Irrespective, it still manages to pack in the crowds. We were there on a Monday night and the restaurant was full to the gills. Whatever Novikov is doing, it’s obviously doing it right. £38 to £164 for three courses. Excludes drinks and service. Wow!.. nice reviews and great website.